The greatest common factor (GCF) of two or more non-zero number is the largest positive integer that divides the numbers without a remainder. The greatest common factor is also called the greatest common divisor (GCD) or the Highest Common Factor (HCF). 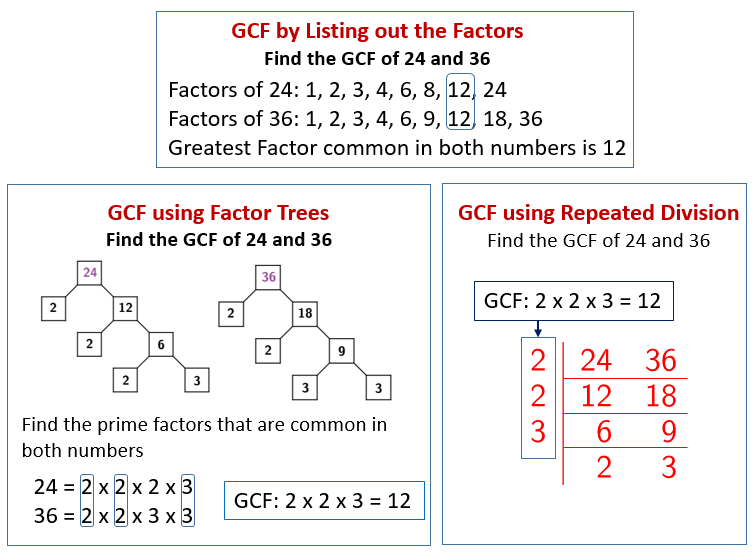 The following diagrams show how to find the GCF by listing out the factors, by using Factor Trees and by Repeated Division. Scroll down the page for more examples and solutions to find the greatest common factor (GCF). In this method, we list out the factors of each number and then find the largest among the common factors. Common factors of 48 and 60 are 1,2,3,4,6,12. The greatest factor is 12. So the GCF of 48 and 60 is 12. How to find the GCF by listing out the factors? Find the GCF of 12 and 8, 25 and 20, 5 and 12, 6 and 12. How to find the greatest common factor of 16 and 20 by listing out the factors? In this method, we use the factor tree to find the prime factors of each number. We then find the common prime factors and multiply them to get the greatest common factor. How to find the Greatest Common Factor between two numbers by using factor trees? Find the GCF of 30 and 42. Find the GCF of 18 and 24, 72 and 90. Here we find the Greatest Common Factor ( GCF ) of three numbers using a factor tree. Find the GCF of 24, 32 and 72. When the numbers are large, using the lists to find the GCF can be slow and tedious. A faster method would be to use repetitive division to find the highest common factors. How to find the GCF of 24 and 36 using repetitive division? Find the GCF of 12 and 42, 32 and 96.